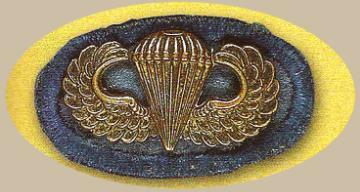 The first Parachute badge was designed during WWII by the Captain (later Lieutenant General) William P. Yarborough of 501st Parachute Battalion. 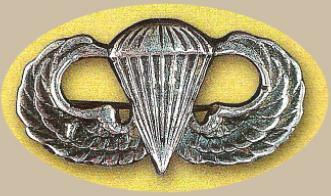 He was ordered in March 3, 1941 to create a specific parachutist badge, it was approved in March 10, 1941. 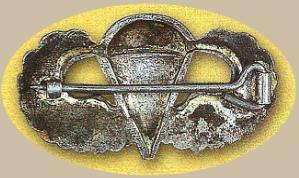 Description : An oxidized silver badge 1 13/64 inch wide and 1 inch 1/2 wide, consisting of a parachute opened above a pair of stylized wings bent inwards. 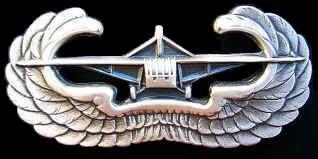 Symbol: The wings suggest flight and the open chute, symbolize individual skills proficiency and parachute. <= The insignia is worn on the oval background unit above the left pocket. Below, the two kinds of manufacture, the American to the left and the English to the right. This badge was approved in Jue 2, 1944. 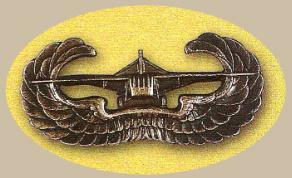 This badge is awarded to men in a regiment of Glider and having participated in at least one landing aboard an aircraft. 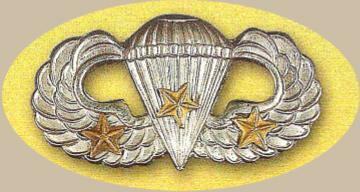 Then, the bronze star is added to symbolize a combat landing. Description : An oxidized silver badge 11/16 inch in height and 1 1/2 inches in wide, consisting of a Waco glider view to the front of a pair of stylized wings bent inwards. Symbol: The wings suggest flight and the glider the different skills and qualifications in aerial flight using the glider.